Keeping the house clean when you have kids can be…challenging. Keeping the house clean when you have kids is like trying to tame an injured, fire-breathing dragon on steroids. You start out with a sensational sword and plenty of armor, and by the time the day is done, your armor has been bent, spit on, and drug through the mud. Your sword is limp, your eyebrows are singed off, and your hair looks like you haven’t brushed it since you were in preschool. While the day is waning and you are wiped out, you’re not nearly finished; much like dragon taming, housework is never done when you have kids. 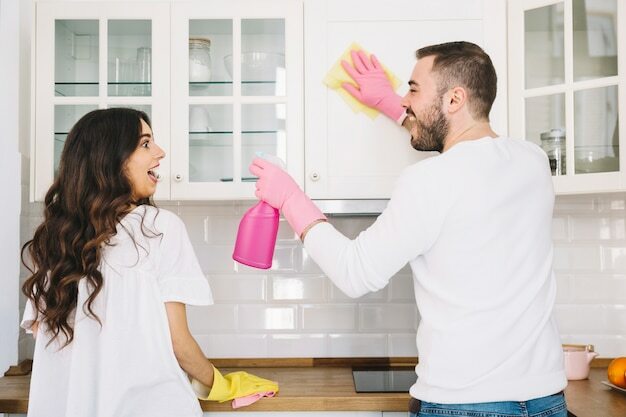 Even though keeping the house clean despite having kids is, well, a giant pain in the rear end, there are ways that you can stay on top of the household chores. I’ve put together some tips that may make it easier for you to get the job done. When I was growing up, we spent our Saturday cleaning house. There was no television or play time until the whole house was spotless. The thing is, my mom had two kids, spaced far apart, and she didn’t work. The house stayed relatively clean during the week, and we mainly needed to do the more extensive tasks such as vacuuming and laundry on Saturdays. With today’s busy schedules, most of us are working or coaching soccer games Saturday mornings. There’s no way we can do it all in one big cleaning binge and trying is only going to lead to frustration. Instead, break house cleaning into several smaller chunks. 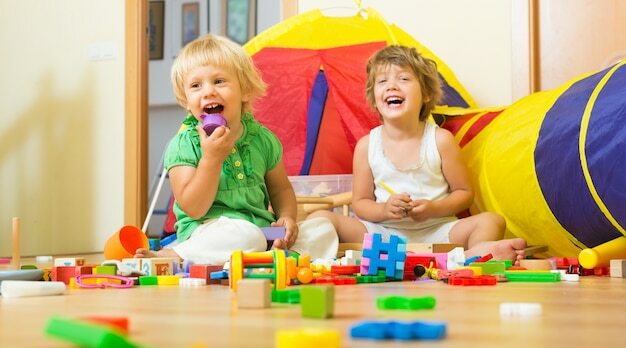 A central play area will make it easier for you to keep toys confined to that area. If your kids are still young, make one of their bedrooms pull double duty as a playroom. Older children can be taught to keep toys in their own room instead of bringing them into the living room. This will incalculably cut down on the amount of time you spend cleaning the rest of the house and make it less likely that you will step on a Lego in the living room. While chores should be age appropriate, there’s no reason you can’t start teaching your kids to pick up when they are relatively young. When your kids are babies, and you’re in that stage where you talk to them about everything, you can tell them what you’re doing as you pick up. Toddlers can be shown to put toys in bins; they may need you to hand them a toy and show them where to put it, but it teaches the habit from a younger age, which means it will be easier to enforce later. Make things easier on yourself. Don’t feel disappointed in yourself if you resort to paper plates. Implement meal prep to save time during the work week. Use the dishwasher. Schedule the birthday party at a park or restaurant so that you have less cleanup to do afterward. There will be days when you just do not get anything done in the house. Teething, terrible twos or the first day of kindergarten may make it impossible for you to get the dishes done or the living room vacuumed. There are going to be days like that. But make it a point to get caught up the following day. If you let it go, you will find yourself with thirteen loads to do and no clean underwear. While gender roles are far less specific in today’s relationships, there may still be an expectation that one parent will do all (or most) of the cooking and cleaning while another parent has other responsibilities. If you can’t get the laundry folded because you worked late and had to rush to get dinner done, it’s entirely acceptable to ask your partner to pick up the slack. While keeping the house clean while you’re raising kids definitely presents its own set of demands, if you try to keep organized, don’t bite off more than you can chew, and ask for help, you should be able to keep a handle on the largest tasks. And relax; your house will be clean all the time when they’ve all graduated from college! Next articleHow Do I Find the Perfect Dog for Me and My Family? Aren’t These the Cutest (Easter-Themed) Deviled Eggs—EVER?